When I saw the title of the thread, my first thought was, "He's already dead." Ah but great heroes don't die they just fade away. In recent internet polls and discussions I thought I noticed a movement away from Shostakovich. I don't think it's possible because just when interest might wain, Karl will post some annoying post in Russian which will be subtitled "listening to Shostakovich's viola sonata lol" And Harry will shake his fist, and then several posters will show solidarity by listening to Shostakovich.
. . . Karl will post some annoying post in Russian . . . .
God help us if infantile ire of the sort is to be perceived as a valid measure of music appreciation. Here's one for you, Davey: Хлеб – богатство народа. Conte Ridolfo, you are the typical internet poster, who when he does not like the opinion, smears the person emitting the opinion, instead of discussing the opinion. I could imagine it's hard not to make fun of someone when that person is just being ridiculous. In recent internet polls and discussions I thought I noticed a movement away from Shostakovich. He does not seem to get ranked as high as he used to in recent polls or lists of favorites and his suporters no longer seem to get as angry when you do not like his music: perhaps not a wholesale rejection, mind you, but the beginnings of indifference. Has anyone else out there seen this? On the contrary, I think some of the old extra-musical prejudices against Shostakovich have faded. And I think we're seeing a hopeful trend of other Soviet composers being "rehabilitated". Toucan can't possibly be taken seriously after making such ridiculous assertions that Shostakovich's popularity is waning. Seriously, the guy is just trying to get a rise out of people, but he picked the wrong bunch to do this with. Well actually he could, but would you pay any attention? Somehow I doubt it. My dear Toucan, your own chronological argument refutes your claim. Shostakovich died in 1975. During his lifetime, only a few of his works were played regularly (e.g. the 5th and 10th symphonies and the 8th string quartet). Since his demise, it's become common to record complete symphony and quartet cycles, and many of the other symphonies are getting a lot more play. The quartet cycle in particular just gets more and more popular, and is increasingly accepted as one of the "Big 3" essential cycles, along with those of Beethoven and Bartok. OK Toucan, let's go back to the beginning. 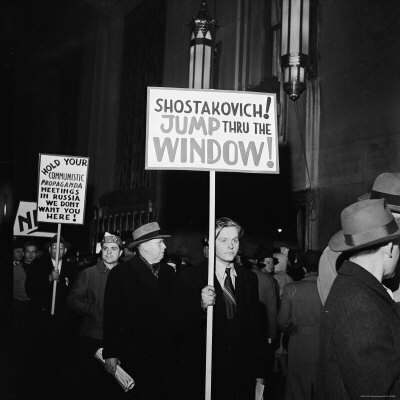 You think people are "moving away from Shostakovich." Can you cite some real-world evidence for this "move away"? Velimir, you truly have not gotten the point. In his life time Thalberg was more famous than Schumann and Chopin and no doubt had the recording industry already existed back then Thalberg would have been recorded far more often than they. Sorry, but we can be sure that the people playing on and buying those CDs are not "people of good judgment and taste," because "people of taste simply have no more accepted the imitations of Shostakovich than they have accepted fake diamonds." The Toucan has spoken (or whatever it is toucans do).